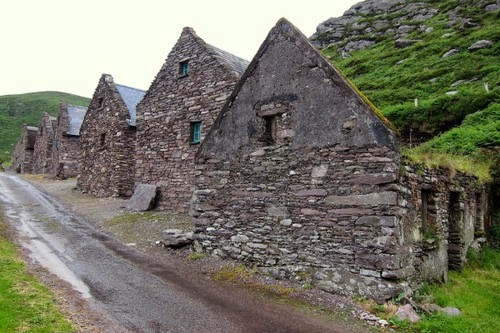 Margo Shea: The Irish Famine: LOL? They say comedy = tragedy + time. A proposed television series set in Ireland during the Famine (1845-1852) has raised interesting questions about how to attribute meaning and weight to each variable in this particular equation. 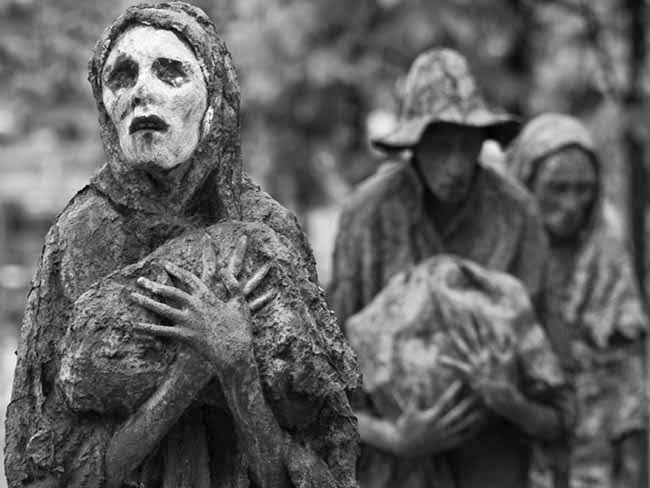 When screenwriter Hugh Travers, a Dublin native, mentioned in an interview that he had been given an open commission to develop a television program by Channel 4, and was working on a tragicomedy set during the Famine, he referred to it as a "kind of Shameless, set during the Famine." Reaction was speedy, and quite what you would expect. Most stories ran photos of Rowan Gillespie's Dublin memorial to Famine victims. The Daily Mail led the race for the headline with, "Is this the Most Tasteless Idea for a Sitcom Ever?" while IrishCentral.com's Irish-American pundit Niall O'Dowd forgave those who thought this was an April Fool's joke. The Irish Times interviewed writers and historians who said it was in poor taste and made inevitable comparisons to other historic atrocities. Indeed, it showed its hand by eschewing any number of historians of the Famine to interview Tim Pat Coogan on the matter. Coogan, the most vociferous proponent of the "famine as genocide" school of thought, was quoted saying, “You really would have to be talking about making jokes about Belsen and Auschwitz and the gas chambers to make it an equivalent thing in our lifetime.” Petitions were posted for people to register a negative reaction; protests outside Channel 4 were scheduled. The Irish Independent's Ian O'Doherty called out the "cranks, lunatics and dyspeptic malcontents" and their "strange mix of wounded indignation, righteous fury, and pointless, irrelevant rage." Well. He told them. O'Doherty pointed out that Joan Rivers, Jessica Silverman and Larry David have all made Holocaust jokes, and hey, they're funny. He took a little dig at Coogan and others saying, "maybe he never watched one of the funniest episodes of 'Curb Your Enthusiasm', which saw an Auschwitz survivor have a furious argument with the winner of US reality show 'Survivor' about which of them suffered the most during their respective ordeals?" The Irish and the hyphenated-Irish poke fun at just about everything and have rarely let appropriateness, sacredness or good taste stand in the way of a story or a laugh. But, guess what? There aren't any Famine jokes. God knows, if there were, Ian O'Doherty would have headlined with them. So. Are people getting worked up for no reason? Would reaction be different if RTE proposed the show, not the Channel 4, as cultural historian of the diaspora Matthew Barlow wondered when we discussed it? Does it matter, Irish writers notwithstanding, that this is a British creation? I am not sure. I keep hearing echoes of the debates over Irish historical revisionism in this furor over the the comedic potentional of the Famine. Questions over the statute of limitations for remembering colonial injustice among the Irish and its diaspora has been on the table for several decades now. Efforts to introduce nuance, sophisticated analysis and a little more subtlety than, "the English did it" have become mainstream in Irish historical scholarship. But what about art and trauma? Is the anger irrelevant? And who gets to make that call? Colm Toibin, in a defense of the clinical scrupulousness and measured, (some would say cold,) 'objectivity' with which revisionist historians approached histories of the period between 1845-'52, observed that the any residual emotion attached to Ireland's traumatic historic events like the Famine belonged squarely in the world of art. "Surely, if we want moral and emotional registers, we will not look to historians: we will read novels and poems, listen to ballads, stick close to our grandmothers and say our prayers." The subjective, the emotional experience, is left to artist and to audience. gave you food to put in your mouth. Recreation and leisure ceased. Could Travers write a sensitive, biting script about trying to make it during the Famine years, that took into account the context, the reality, the consequences? Quite possibly. Does he have a right to, when the memories and ghosts look on? Maybe. But the risks of getting it wrong, to me, at least, are higher than the rewards of getting it right. I'd find another topic. Something less painful. Like, the Falklands, maybe?